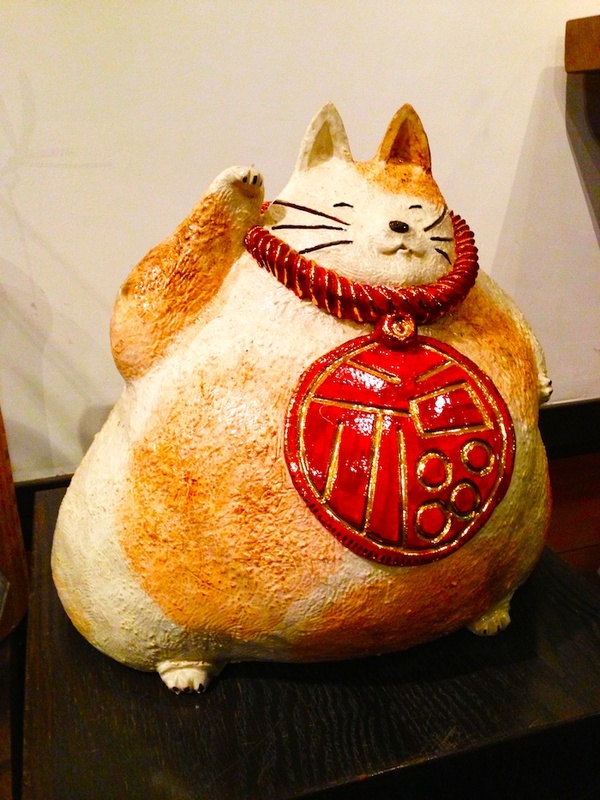 Photo Dump of Cool Stuff Around Tokyo – And the Fattest Cat in Japan! I walk around Tokyo all the time (Duh! I live here). I always carry my smart phone or a video camera. I take photos of interesting things I see. It’s almost Japan’s Golden Week vacation so I thought I’d share my photo’s on my semi-annual “Photo Dump of Cool Stuff Around Tokyo!” If you are looking for photos of Tokyo Tower or Asakusa or the usual Tokyo fun spots, you won’t find them here. This is a photo dump from some of the back streets and alleys around town. This is an E.T. 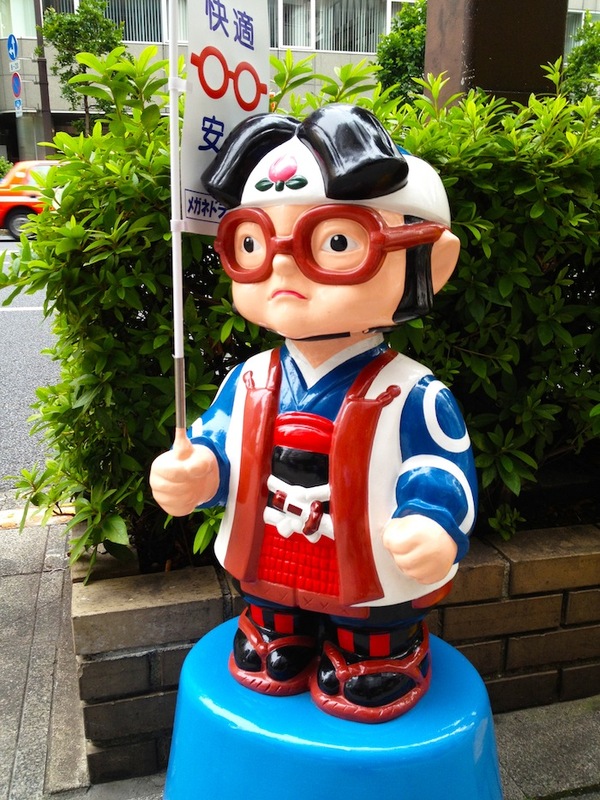 that is standing outside a small restaurant in Motosumiyoshi on the Toyoko Line. 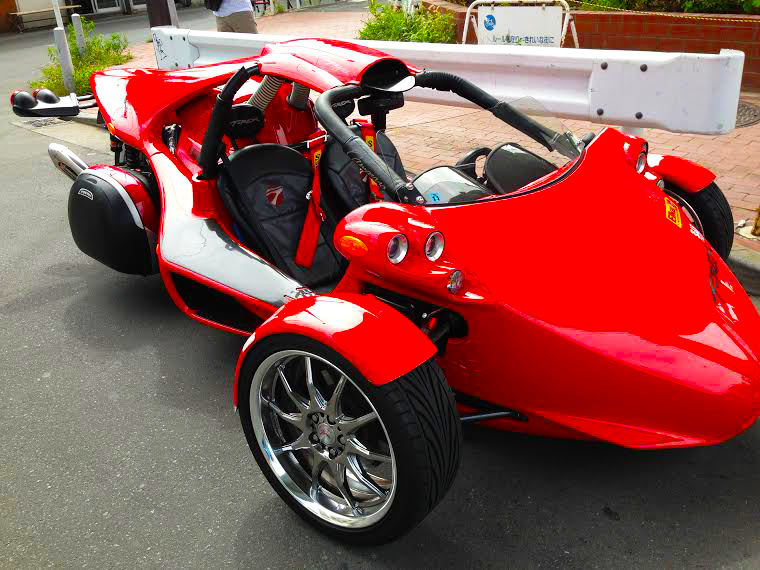 Is it a bike or a car? I don’t know but it’s cool and was parked right by the train station where I live. This girl was walking along in Setagaya-Ku and I saw her coat in the early morning. 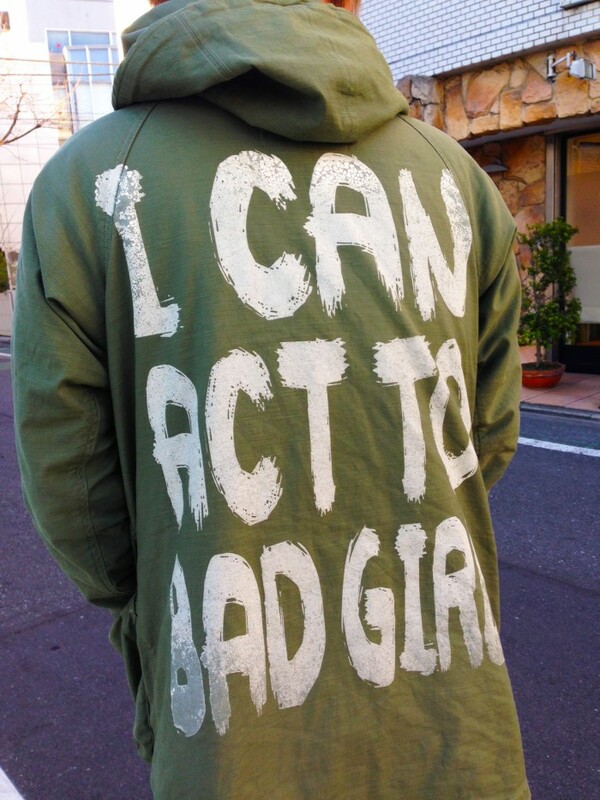 It says, “I can act to bad girl.” The longer explanation was even more convoluted. “Adult Convenience”? I guess it’s kind of like a 7-11 convenience store. I also guess that the only thing really in common with a convenience store is that this place, besides daily goods, also sells batteries. This was at my favorite sushi place. 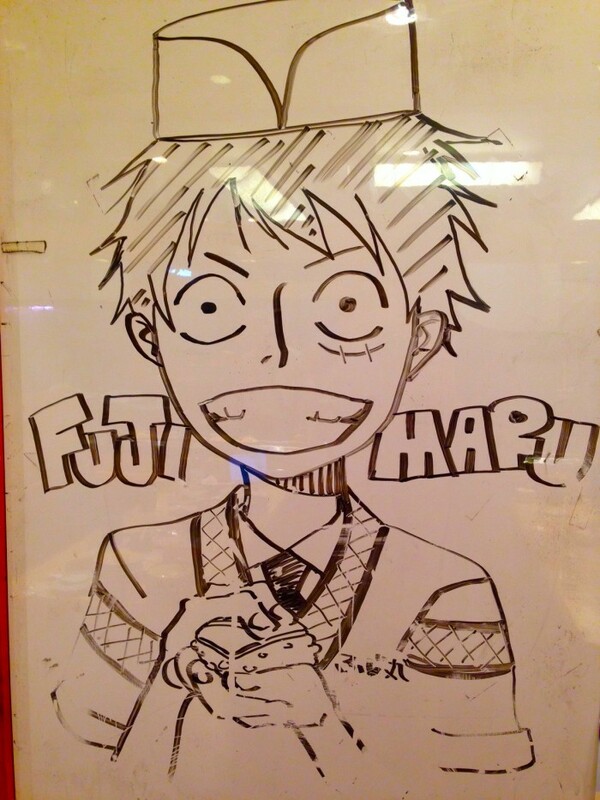 I guess one of the young staff who aspires to be a manga artist drew this at work. Not bad, but pretty typical, I guess…. Look who’s talking! Much better than I could do! The fattest cat in Japan. Maneki Neko is what they call these. 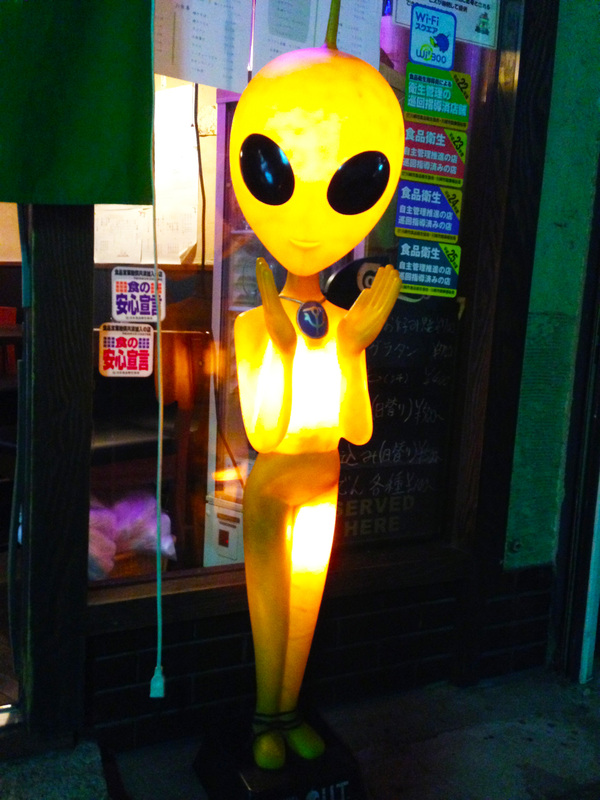 They sit at the front of restaurants and establishments beckoning customers to come in and spend money. This is, by far, the fattest one I’ve ever seen. I guess that means he is REALLY lucky! 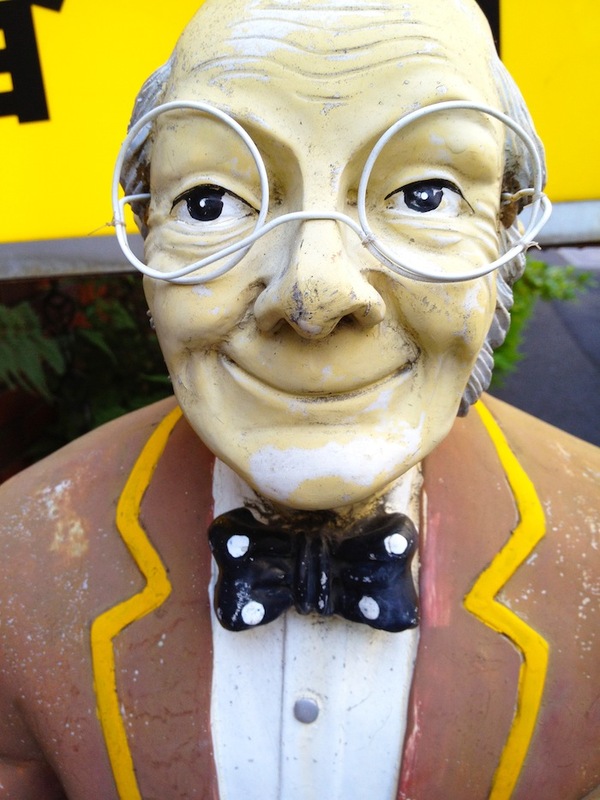 Finally, here’s a statue of a nice old butler that resides outside of a small coffee shop near Hanzomon station. 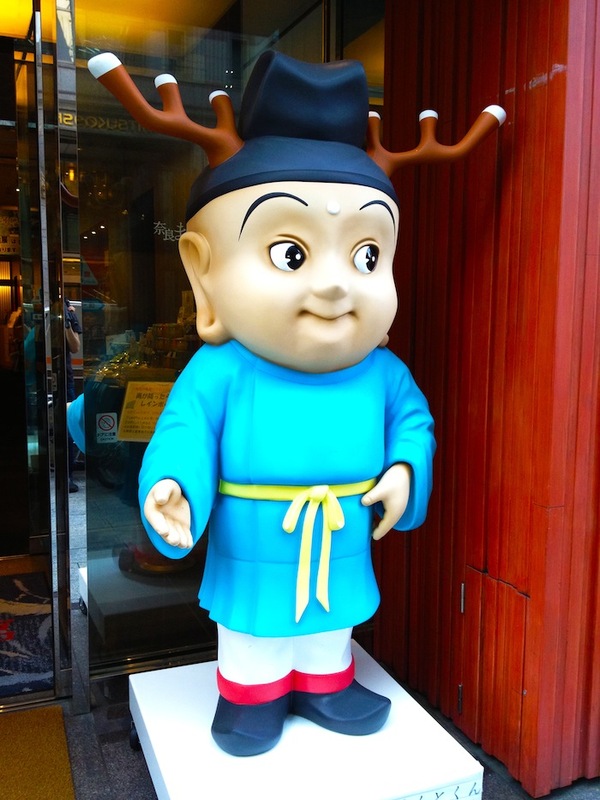 This statue is standing there outside everyday, 24 hours a day, 365 days a year in downtown Tokyo and no one vandalizes it or steals it. It’s been there for at least 15 years… Probably much longer. The first time I saw the nice old guy, was in 2000 when working close by. I remember because I went to that coffee shop that day. He is still there and doing well! It’s nice that he is too… It is just one more things that reminds that Tokyo is still the world’s safest city. Today, I’d like to write a bit on the beauty of doing things yourself. The so-called, “DIY” philosophy. I like DIY for several reasons. Firstly, whatever one does, when they do it themselves, it truly is a reflection of themselves and their heart and soul. Secondly, it is not some concoction that was made by some professional who makes things for people in an office far away; it is “Real.” Thirdly, because it was made by the people who really do have a vested interest in their product or service, it is much cheaper. Fourthly, making something for someone – whether it be dinner, a birthday or Christmas present shows true love. Making things DIY takes heart, a dream, sweat and practice. Is this any different from starting your own business, club, restaurant, band, music or any other project? When you do it DIY it is true love and shows your sincerity much better than anything one could buy at any store! 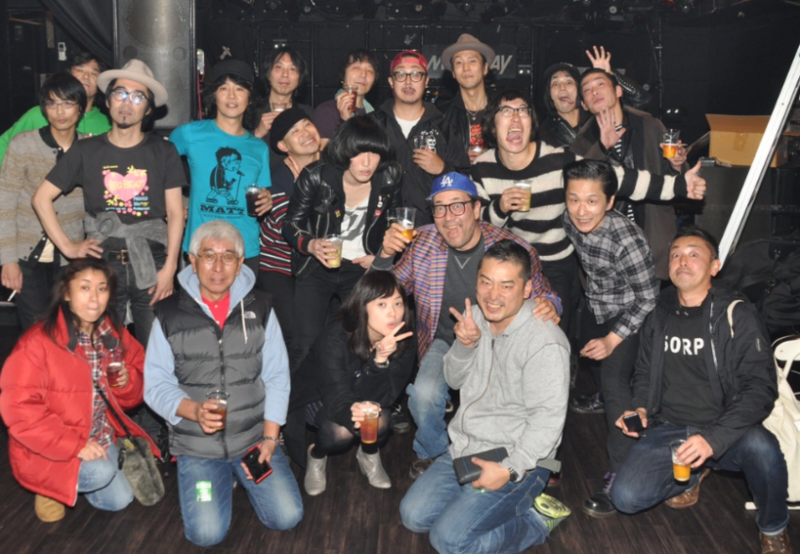 Staff poses for photo after DIY event in Tokyo on Jan. 26, 2015. That event holds the record for attendance at that club. Tatsuji Nobuhara is standing in the back with the aqua blue T-shirt. Immediately behind him is Ken Nishikawa. Mr. Pan is the guy standing in the back with the brown hat. I’m wearing the stupid Dodgers baseball cap. There are several other famous rock stars in the photo including the 50 Kaitenz. Can you spot them all? (Photo by Osamu Arai). I have a few good friends that always do D.I.Y. and that really impresses me. Today I’d like to tell you about them. Thirty years of doing things independently and making a good living at it; it’s the true “Rock and Roll” dream – and everything they do is DIY. They manage themselves and do all their own booking. 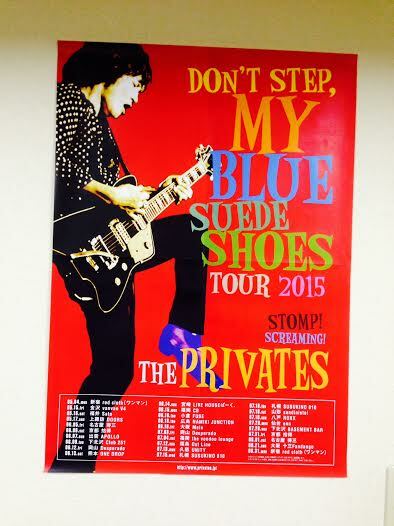 Not only do they have their Friday, Saturday, Sunday and holiday schedules booked up with performances around Japan, The Privates and the Neatbeats tour the world too! I think these two bands are an inspiration to us all! Really. Can there be any better way to really live the true “Rock and Roll Dream”? 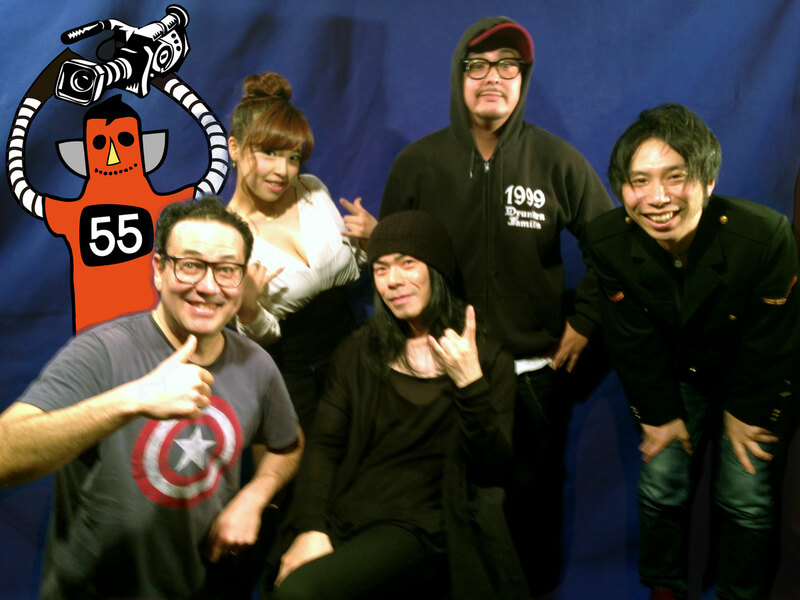 Yesterday, we had a meeting about the Japanese Rock and Roll Ghost Story movie we are making. After the meeting was over, I asked Nobu what his plans were for the evening. He told me that he was going to some office and was going to design his posters and T-shirts. This morning, he sent me some photos of the stuff he is making. Wow! I am impressed! This stuff is so cool! And, like I said, it is “Real” and it is him. His idea, his sweat and his efforts. He is creating a legacy for himself that will last long after he has died and left this earth. Isn’t that what it’s all about, my friends? Don’t we all want to make something to leave a legacy for our children and our children’s children? I know I do. If you are running a business or club, why don’t you start making all your promotional posters and logos and designs yourself? And how about making a video for Youtube to promote your business? Hate to sound like I am a salesman, so I’m giving you free professional advice on how to do so below. It will be a reflection of you and who you are. At Robot55, we make videos for businesses and services. We can help you to create something that is the real you. This is why we always try to make the proprietors of every business to be in their own videos! People no longer want to see an actor or actress (who doesn’t use your product or service or isn’t your ‘fan’) telling them how great something is; it’s not “Real.” But you being in the video, now that “Real” and it’s sincere. Here’s one we made (it’s in Japanese) and we insisted the shop owner tell his own story. This is fabulous! The owners tell us that their business is booming! If you want to make your own video, do it. Here’s some free advice from me on how you can make a great video for your project for absolutely free! 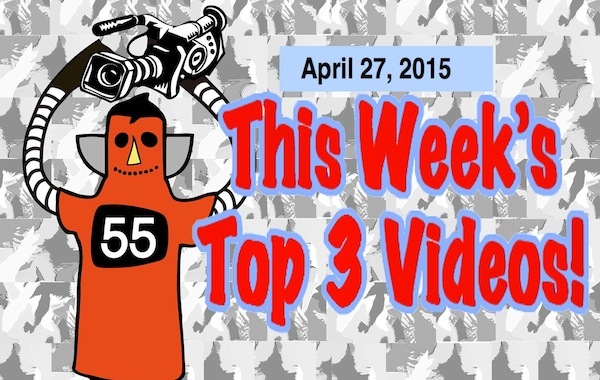 Time once again for this week’s Top 3 New Artist Videos for the week of April 27, 2015. This week I want to show you my fave videos for the week. And, guess what? It’s ladies day at the Starlight Ballroom! So all three videos are from girl’s groups or bands with lead vocals. But enough of my yappin’! Let’s rock! Danny from the 50 Kaitenz sent me this first band and he recommends them highly. One listen and so do I! This is a new girls group from Kobe and all 4 of these girls are in their senior year at university! They are hot! Next up is another new artist and her name is Colleen Green. She is considered is an American “indie pop” musician and she is from Los Angeles, California. She is currently signed to a cool label with a great name: Hardly Art records. Next up is one of my favorite groups in the entire world! Their name is Taffy and they are great! I haven’t heard music that I like this much since the British Pop movement of the early nineties and bands like The Primitives and Transvision Vamp. Here they are with their latest song that is making heads turn. Well, that’s it for today. See past weeks of Top 3 Video countdown below and see you back here next week! Natsume Soseki and Me – Another Unbelievable But True Story! I’ve even been to towns in Kyushu that had temples that were almost 2,000 years old. So, a couple of hundred years old is not that big of a deal here. On my particular street, all of the folks who have lived here for 30, 40, 50 years (or more!) are related somehow. I hear this land was farmland 100 years ago and it was owned by the grandfather of all these good people who live here; the Uchida family are blood-related with the Watanabe family (of which there are two Watanabe families; and, of course, they are related to each other). And all of them are related to the Yanai family who live in the back corner of our road which ends in a dead-end besides the Yanai family house. I also hear there used to be a small temple up the road by where the Yanai house now stands. Like I said, I love to sit and chat with folks who lived through the good and bad times of the past. In Japan, people who saw World War II and lived through the fire-bombing of Tokyo or the atomic bombings; or experienced the “Japanese Economic Miracle.” Even if they weren’t there in that exact place, they all have their own dramatic and thrilling stories to tell. I feel sorry for young people who are not interested in these amazing lives these fascinating people have lived. I respect these folks so much. Of course, I always give up my seat on the train for them and try to help them out if I ever can in some small way. You should too. Why not? We all are going to be old someday and we’ll need all the help and kindness we can get. But I digress… I was talking about my neighborhood and neighbors. I like to be a good and kind neighbor if I can. One day, several months ago, I was walking around the neighborhood and saw Mrs. Yanai on her hands and knees doing something on her porch. As I walked closer to investigate, I saw that she was scrubbing off some sort of mildew that had built up on her porch. “Oh, my gosh! What backbreaking work!” I thought. Mrs. Yanai is a very nice lady and she is always sunny and smiling. I like her a lot – she sort of reminds me of my own mother. So I ran over to her and asked what she was doing. She confirmed what I had thought so I volunteered to come over with my Karcher high-pressure water cleaner and just blast away at the mildew for her. It just won’t do to have Mrs. Yanai on her hands and knees scrubbing the porch, would it? So I volunteered to do it. A week or two later, when I had an off Saturday, the job was done. My device couldn’t clean as well as I had hoped, but it was a little bit of an improvement, I think. Mrs. Yanai seemed a bit happy. I was happy with myself. Fast forward a year or so and I went to the Yanai family house again this morning to volunteer services. Mr. Yanai invited me into their home and we sat and chat. He’s an extremely friendly guy too and has a tons of great stories. As we were talking, I asked if I could look at some of the many photographs and collectibles they had in their house. It was then and there I saw a photograph that just dropped my jaw. I knew immediately who the man sitting on the left was in the photo. It was Natsume Soseki! I also immediately knew that this photograph had to be on their living room mantle place for a very good reason; there must be a blood relation to him in the photo. 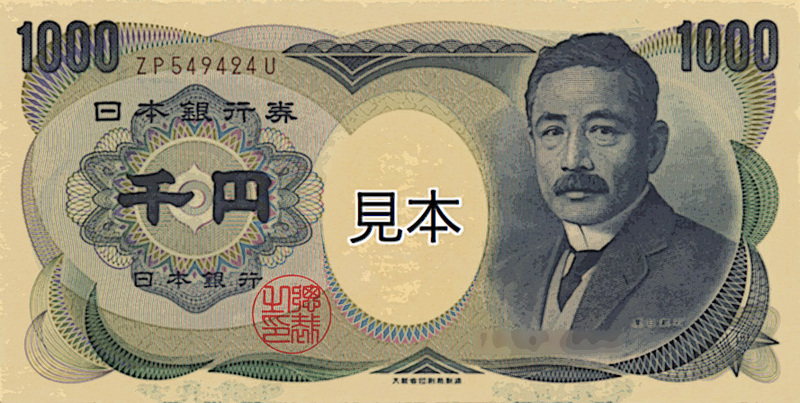 Folks, Natsume Soseki was the guy on the Japanese ¥1000 bills. The top of your head might blow off! What are the chances of something like that being in your neighbor’s house? In my neighbor’s house! You have a bigger chance of winning the lottery than something like that happening! Natsume Sōseki (夏目 漱石) February 9, 1867 – December 9, 1916), born Natsume Kinnosuke (夏目 金之助) was a Japanese novelist of the Meiji period (1868–1912). He is best known for his novels Kokoro, Botchan, I Am a Cat and his unfinished work Light and Darkness. He was also a scholar of British literature and composer of haiku, kanshi, and fairy tales. 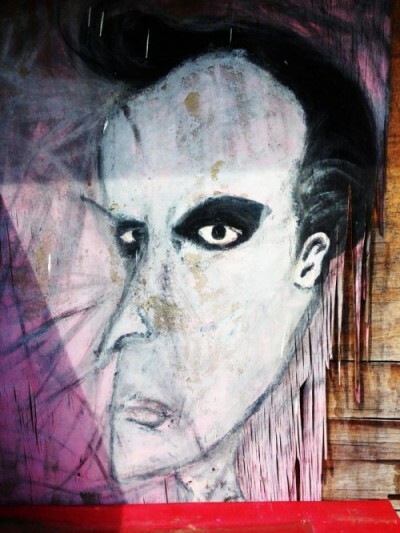 From 1984 until 2004, his portrait appeared on the front of the Japanese 1000 yen note. In Japan, he is often considered the greatest writer in modern Japanese history. So that’s the explanation of the photo at the top of this article. In that photo, Natsume Soseki (夏目漱石）is sitting down to the left. He is 44-years-old at the time. 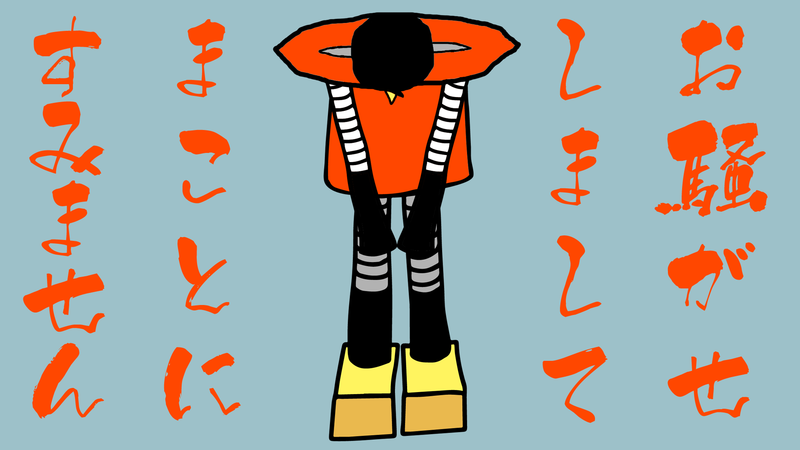 Standing is Gyoutoku Toshinori　(行徳　俊則）. He was a doctor and is the uncle of my neighbor Mr. Yanai. 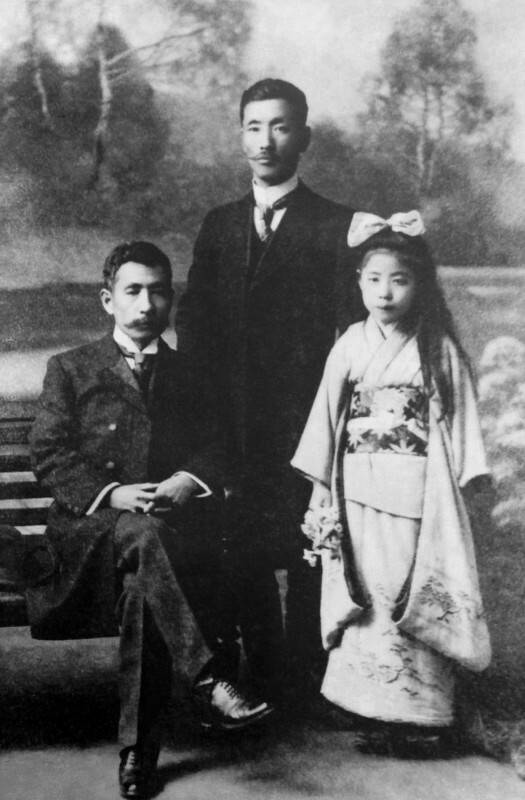 The little girl to the right is Natsume Soseki’s granddaughter, Hisayo. This is a very rare photo as there aren’t very many photographs of Natsume Soseki in existence and this is in superb condition too. It seems that Gyoutoku Toshinori was in Kumamoto and there he met his friend, Natsume Soseki, purely by coincidence. Natsume Soseki was so pleased that he asked him to sit for a photo session together. What a treasure! It just goes to show how we must take lots of photographs and videos to show the children of the future! 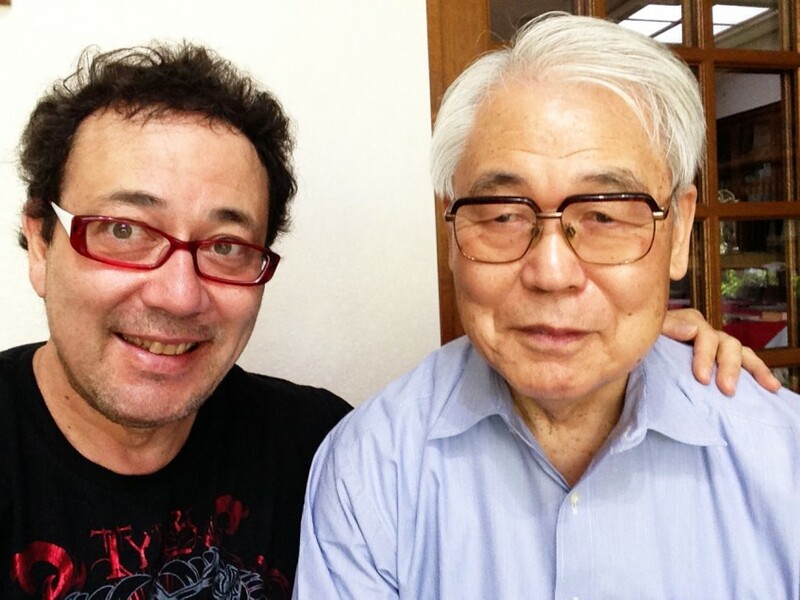 And, for my own treasure, here is a photo of me and my neighbor and friend, Mr. Yanai (柳井一生). The nephew of Gyoutoku Toshinori – who was a great friend of Natsume Soseki! 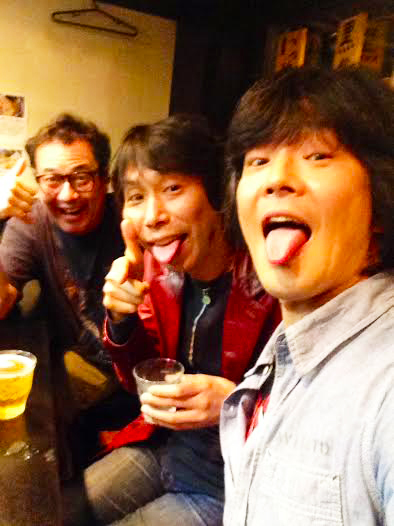 And, as they say, any friend of Mr. Yanai is a friend of mine. Thanks Mr. Yanai for your friendship and the really great and interesting story! Now you know how close I have come to Natsume Soseki! Gee, I wonder if any of my neighbors had relatives who were best friends with Akira Kurosawa the movie director, or even Shakespeare? I guess I’ll have to ask around. The Old Mass Media Heading Out the Door? The old guard media are on the way out and there’s no way to stop it. Yesterday, I had a meeting with the president of one of Japan’s leading internet companies. They run the biggest and most popular blogging portal in Japan as well as many other internet related business and internet media broadcasting. Their business is exploding. Did you know that nearly all smart phones have FM radio built in to them but the makers do not turn it on because they have determined that there is not enough demand for it? Did you know that all Japanese car manufacturers stopped putting FM radios in cars as a standard item in 2010?It’s now an option; you have to pay for it if you want it. Did you know that there is not a single company in Japan that manufactures FM radios anymore? According to a recent survey of Japanese young people by one of Japan’s largest publishing companies, people between the ages of 13 to 30 showed that only 11% had a TV in their bedroom. Less than 7% had a radio. But over 98% of those people in that demographic had a smart device or PC in their bedrooms. In what will likely be the opening move in a global transition to digital radio, Norway has announced it will shut down its FM band. In its statement, the Norwegian government said the cost of transmitting national radio channels through the FM network is eight times higher than via the Digital Audio Broadcasting (DAB) system, the standard digital radio technology used across Europe. Wow! A digital radio station can be operated at 1/8th the cost of a traditional FM station? 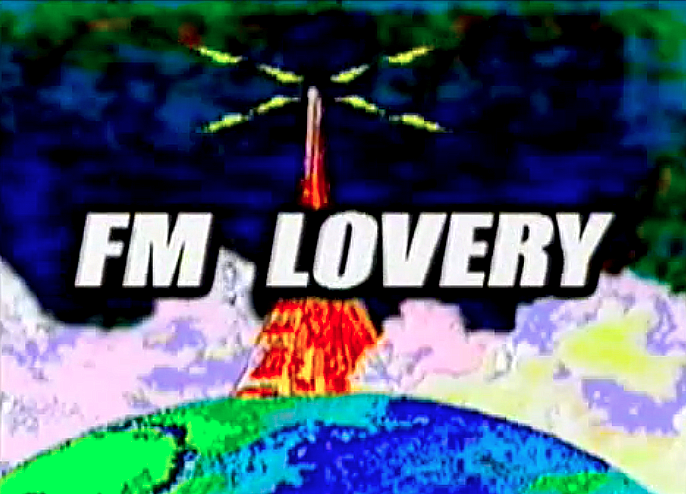 The writing is on the wall for FM radio. It has been a wonderful partner and part of my life. I love FM radio. I hate to see what is happening. But progress shall not be stopped. Time once again for this week’s Top 3 New Artist Videos for the week of April 21, 2015. This week I want to show you my fave videos for the week as well as a new video we made for a Japanese band named Su Ko D Koi, (which I think is one of Japan’s best new girl punk bands!) Of course, I play these artists and these songs on my regular weekly FM radio show, “What the Funday” on InterFM that is broadcast in Tokyo and Nagoya (and all over Japan on the Radiko.jp network. You can listen to that (if you are in Japan) here: http://radiko.jp/). First up, if you liked the Psychedelic Furs then you are going to love this! It’s Psychedelic Furs former guitarist John Ashton’s newest group, Satellite Paradiso. John Geza Ashton is a British musician, songwriter and record producer. He is a guitarist and former member of the Psychedelic Furs along with brothers Tim and Richard Butler. Since the band reformed in 2001, Ashton has joined the band on occasion for tours. Currently, Ashton is an active producer, and has worked on a number of projects including Marianne Faithfull, The Sisters of Mercy, Red Betty, and Seven Color Sky. His first solo album, Satellite Paradiso, was released on 27 May 2014. Ashton currently resides in Woodstock, New York. Next up, could this be Japan’s hottest new girl’s punk band? Their name is SU凸KO D凹KOI! (Su Ko D Koi). The powerful sound these girls make is incredible! And there’s only three of them! The song is called, “Busu” which means “Ugly.” Check it! “Ugly, ugly, ugly, ugly…. I know I am ugly…. But, I got a boyfriend and we have been going out. But one day, out of the blue, he hit me for no reason. I woke up in the hospital and he had his head in his hands. But, I finally was able to realize that finally, he treated me like a woman! And last but not least, the Ettes. The Ettes are a garage rock band that formed in 2004 in Los Angeles, California. They are now currently based in Nashville, Tennessee. That’s it for today. See past weeks of Top 3 Video countdown below and see you back here next week! Old VHS Video Tapes Becoming Expensive Collector’s Items! Do You Have Any of These Tapes? Remember those old VHS video tapes that everybody had back in the eighties? Well, now some of those old VHS video tapes might be worth a bunch of money! That’s right! Some VHS tapes have now become valuable and collectable antiques selling for several thousand dollars! 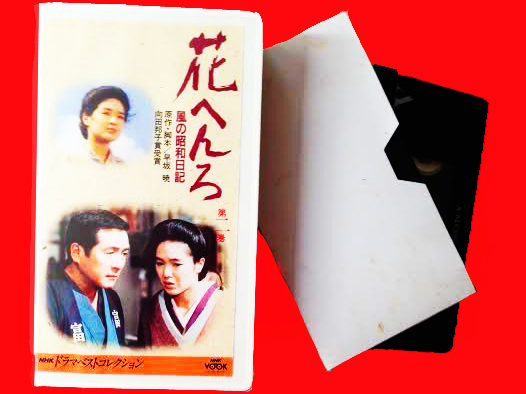 Now, antique and collectable professionals and experts say that those VHS tapes are joining the ranks of vinyl records as valuable and rare collectibles and some of them have been getting sold for over ¥1,230,000! (That’s over $10,000 (USD)). As the years went by and DVD’s became popular, VHS tapes have disappeared from the average household. Add to that the big retail chains going bankrupt and you have a massive amount of VHS tapes being dumped and ruined in land fills. But VHS cassettes and boxes that are still in good shape can demand high prices. They have been gone and out of our existence for just long enough to inspire nostalgia. I once saw David Bowie’s “Man Who Sold the World” (The Orange Jacket) selling for over ¥4 million yen (That’s about $40,000 (USD)) at a store in Shinjuku! Today, some VHS video tapes are considered just as collectable as original records. Did you know that charity stores like Goodwill or Salvation Army and other second hand stores won’t even take the VHS tapes and machines for free? because nobody wants them! But it is because they are being thrown out in the trash that they have become valuable. Uh, you wouldn’t, by any chance have any old Betamax tapes or a Betamax player, would you?